I’m going to tell you a little story. Last Friday I had a mini-meltdown. No, seriously. There was ranting and raving. I think I may have thrown something… there were even a few tears. I questioned why I even bother trying to write and publish and the sheer impossibility of ever being able to put something out that’s error-free. You see, when you’re indie-published, you have this overwhelming need to make sure everything you do is “perfect.” We don’t have the resources of a huge publishing house, their personnel list of umpteen copy editors, proofers, etc… we must do everything ourselves, we must hire our own editors and proofers, then work with beta readers, then possibly even beg and plead with friends, to help proof our books. I sometimes feel like it’s all just too overwhelming, to be honest. So, back to the meltdown… It all started with me trying to figure out what makes people want to buy my novels. I’m on a lot of social media outlets and trying different things on different sites. I tackled instagram this month and started a hashtag contest for readers to upload my novel THE HUNT FOR XANADU with the hashtag #xanaduquest, and they will be entered to win one of five signed hard covers of the next novel in the series, THE QUEST OF THE EMPTY TOMB. 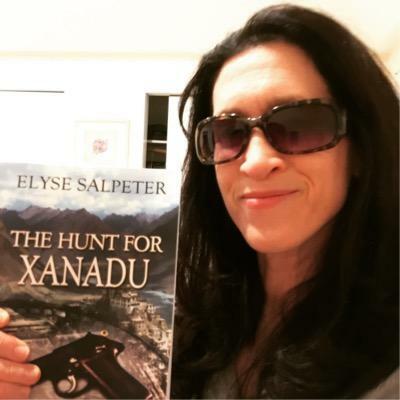 It’s been going well so far and I made a “Fan Shout-Out” page on my website at http://www.elysesalpeter.com if you’d like to check it out. I then promoted it on twitter, google+ and then to my author groups on FB. Well, lo and behold “eagle-eye” editing/proofer friend, Bob Nailor, side emailed me and told me laughingly that I had a few edit problems with this paragraph. I went “stone cold.” Edit problems? How can there possibly be any edit problems? I’ve had this book out for over a year and it’s been scanned through meticulously. He HAD TO BE WRONG. But he wasn’t. Can you see the errors above? I couldn’t. It actually took me THREE reads to find what Bob was talking about – and he even told me what they were. Apparently there should be a comma after the word “drugged” but more importantly, there should be the word “be” after “reckoning it would” – which I obviously missed. Not to mention I see a spacing issue, too, between “an impressive.” But you know what kills me? What made me have my mini-meltdown? I published this book December of 2013. I had an editor, a proofer and six people sifted through it before it went live. I read it myself easily fifteen times. I had six updates I put on both Kindle and Createspace because people kept finding errors. But no one found this… until Friday. No one found this error IN THE FIRST CHAPTER, until Friday. The mini-meltdown happened for about twenty-five minutes where I decided I was going to quit writing, that I was an utter hack and maybe the books hadn’t gotten traction because they are “riddled” with mistakes. And then my writing friends talked me down. My book isn’t RIDDLED with mistakes. It’s missing a “be” and it’s one of those words the mind actually adds as you’re reading the copy. Most people probably never even noticed. (well, unless you’re Bob Nailor). I’ve calmed down, fixed the document and re-uploaded the fixed document to both kindle and createspace – I’ll have to figure out how to fix the copy on ibooks. There is so much noise in social media that sometimes it’s hard to be heard. A hashtag (used with the # symbol) is a great way to “target” a particular topic so that you and your fans can search for it easily. I’ve used hashtags regularly for Twitter events, such as #FP for Friday Phrases – which is a weekly micro-fiction game on Fridays, #mondayblogs where people search for blogs to read each week on Mondays, or #writerskaboodle, where readers can see interviews with Sezoni Whitfield on twitter and facebook. Authors, definitely check out her Writer’s Kaboodle blog. She does author Q&A’s on twitter and FB you can have your own live event – fastest 30 minutes OF MY LIFE! You can also use a hashtag to find things that you’re interested in. #thrillers, #free, #gardening, #cooking, #recipes – you get the idea. To add a hashtag to a post, all you do is write the post and then add the hashtag to it. Then, if you ever wish to search this particular hashtag and anything related to it, you go into ANY search area on any medium, type it in and you can see all the related posts to that particular hashtag. If you don’t like posting, but reading particular topics, just type it in and find what you’re looking for. I also announced the contest to my Facebook author page and boosted that post $15 so far – I plan to do a few dollars every week until I hit $20 and have had over 2200 people see it now, gotten over 70 likes and lots of comments. BUT, what I can tell you is that many of my readers have uploaded their photos on the Facebook stream with the #xanaduquest hashtag. What I’m finding is that many of my readers are ONLY on FB and not on twitter or instagram. As a result, I’m allowing those people to be part of the contest as well, and their photos are up on my webpage, too. By doing this contest I’ve now learned where a lot of my readers are coming from and that is extremely helpful to know. It’s hard enough to get people to actively do things – but to get them to actually upload a photo? I’ve had about 10 people upload photos right now and I’ve had a bunch of sales of THE HUNT FOR XANADU since I started this. I even got a review in, so I have to think this is a successful contest so far. It’s going to run until 2/21, so my hope is that I get double the amount of people and simply fill the webpage and possibly even be lucky enough for my hashtage #xanaduquest (a mix of The Hunt for Xanadu and The Quest of the Empty Tomb) to “trend.” Trending is when a hashtag gets a lot of play and people start using it. If you go to twitter, instagram or Facebook right now and plug that hashtag in the search area, in you’ll see a bunch of entries across the board. It’s now on my profile on my instagram acct, I promote on twitter, directing to my webpage, google+, FB author page, here on wordpress, and created a goodreads event about this (though I can tell you only 4 people out of nearly 4000 at this point have even responded – goodreads is better with free books, giveaways, listopia lists and launch event information in my opinion). I may use my regular FB page mid February for one last push for folks who might not have remembered to enter. I’m always looking for new ways to interact with readers – so if anyone has any other ideas, please feel free to share. I’m all ears. How would you like to win one of 5 signed copies of THE QUEST OF THE EMPTY TOMB? Here’s something totally fun! 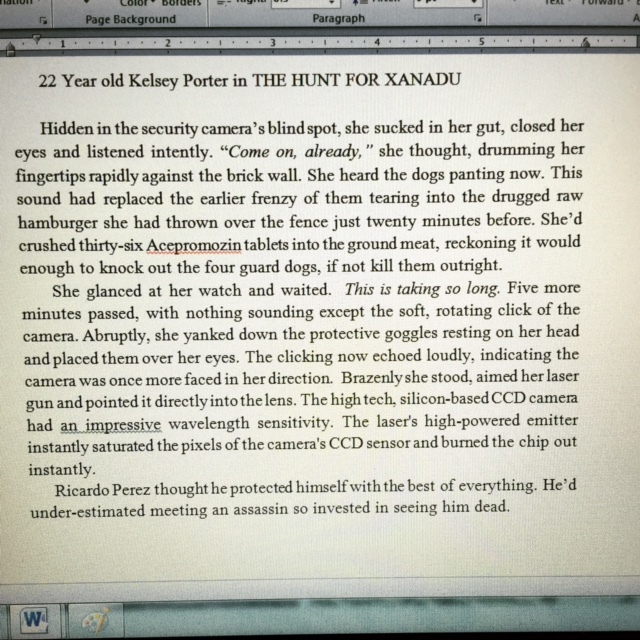 How would you like to be one of five lucky winners to win a signed hard copy of Book #2 in the Kelsey Porter series? I’m launching THE QUEST OF THE EMPTY TOMB on February 28th and doing my first Instagram/Twitter contest to kick it off. 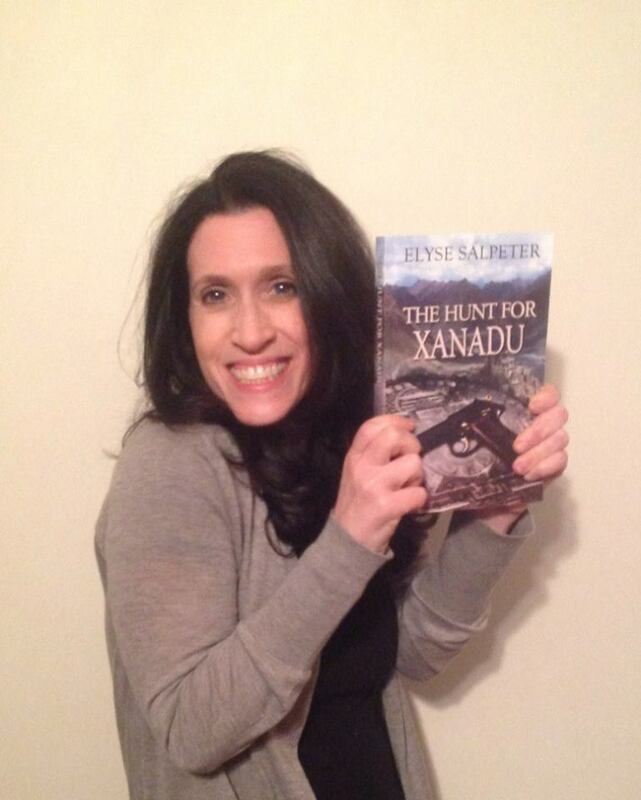 All you have to do is upload a snapshot of yourself holding a copy of THE HUNT FOR XANADU, or of you with the cover showing on your Ipad or Phone and UPLOAD it to Instagram and/or Twitter with the Hashtag #xanaduquest Don’t forget the hashtag #xanaduquest as that’s how I’ll find you. I’ll keep a record of all the names and FIVE people will win a signed hard copy of THE QUEST OF THE EMPTY TOMB in a random drawing. Contest ends on 2/21/15. Want your photo up on my website at http://www.elysesalpeter.com? Check out my “FAN SHOUT OUT” of folks who have already given me their approval to put their photos up. Let me know if it’s cool for you and you, too, can be on my webpage. Twenty-two year old Kelsey Porter has dedicated her life to avenging the death of her parents, murdered in their quest to find the mystical land of Xanadu. Before she can locate the murderers, she has to discover their motives for the brutal crime and finds herself at the epicenter of a Buddhist mystery as old as time. With the help of her companion, Detective Desmond Gisborne, she hunts the killers across the globe and discovers a darkness in her spiritual past that tests the very limits of her soul. Soon she realizes that it is not she who is doing the hunting, but the one being hunted. Kelsey must find a way to survive, while ancient demons attempt to destroy her. Soooo, want to hear what THE QUEST OF THE EMPTY TOMB is about? Where XANADU took you to Tibet, QUEST is taking you to…. EGYPT! On the heels of THE HUNT FOR XANADU, Kelsey returns from Tibet with Desmond to begin a new life in New York City. But peace is not to come to her. One night, a stranger appears at her door with a note from a man from her past, begging for her aid. It involves her parents and Kelsey leaves for Egypt to learn the truth. But the truth is more than she bargained for. What secrets did her parents hide? Why is she now plagued with odd aches and pains and why is she having nightmares again? Kelsey must find answers and the only way to get them is to confront her demons and solve the ultimate mystery: The Quest of the Empty Tomb. See you all on social media! 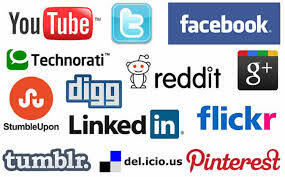 How many social media sites can I possibly be on? No… really, how many? The other day I chatted with a woman who does promotions for authors. We were discussing her services, I explained what I do and she took a peek at my activity and she said “you actually do more than I do for my own clients.” Okay, then what does that mean? I’m active on so many social media sites, and I get tons of conversations, but how do I translate that to consistent sales? I honestly don’t know. She suggested I start looking at bloggers. I said “but “I’ve been on a ton of blogs.” She said, “no, get on the RIGHT blogs. The fandoms, the biggies.” So, now I’m thinking about how to find book bloggers, and will start spending some of my social media efforts on finding these people. Where’s the easiest place for me to find book bloggers? Turns out on Instagram. I’ve done some small little things are Instagram, but true to form, now I want to conquer it. So, I updated my profile, started following book bloggers and started to learn how this works. The ins and outs, the hashtags, the little nuances that Instagram offers that are different than FB, Twitter, and all the other sites. The first thing I can tell you is that younger people are on there. The teens and twenty year olds. People in their 30’s, definitely 40’s and 50’s, are on Facebook. I hardly see the kids on there unless they’re following adults who only put information on FB and that’s the only way they can reach them. As for tumblr (sorry, ain’t happening yet – I can’t even figure out how to get off the first page), tsu (sort of like FB but I’m too invested in FB to worry about this yet), Stumble Upon (I’ve got an account and never used it) Reddit (not quite sure what this is), flickr (completely not sure what this is), myspace (is that even still around? ), youtube (yeah, I’ve put some book trailers up there) and the others? I think I’m maxed out for now, thank you very much. Of course, if there is something new and BIG, something that will help me reach readers better – please let me know. I do love to hear about the newest stuff out there.